There are dark films… and there are dark films. For some, a straight-up horror movie with a somewhat glib ending constitutes a truly “dark” film, whilst some will consider the ending of The Empire Strikes Back as dark. Me? Well, you’ve got to do something pretty darn subversive for me to label a film as “dark”. Take the darling of controversy, The Human Centipede, as an example. For some, the material was considered so offensive that the film was labelled as filth. But me? I just thought it was a lazily constructed, terribly acted film. Nothing more, nothing less. But every so often, a film crawls along that makes me think “wow… this is a dark slice of cinema”. Stoker is that film. 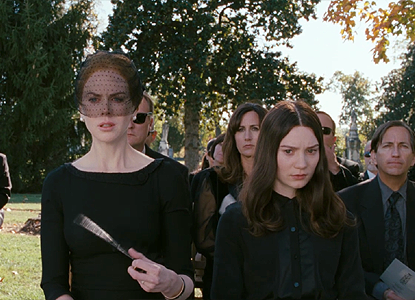 Stoker primarily focuses on India Stoker (Mia Wasikowska) following the death of her father. All she’s left with is her emotionally-detached and disturbed mother, Evelyn (Nicole Kidman), and the staff that work at their home. This all changes when her estranged uncle Charlie (Matthew Goode) turns up at the funeral and stays for an extended period of time. She’s not alone any more, but the token of family solidarity isn’t what it initially seems to be either. Who is Charlie? Why hasn’t she heard of him before? And just why is he so weird? To go into any more depth would destroy the film entirely. Chan-wook Park‘s Stoker is teed up as a psychological thriller that’s meant to harken back to Hitchcock films of yesteryear. The film oozes style in the way that it’s shot and it truly does harken back to that period… if only I really enjoyed that period of cinema. I’m much more of a modern cinema junkie than I am into the “classics” that people rave about. For some that’s blasphemy, but I couldn’t give a damn. 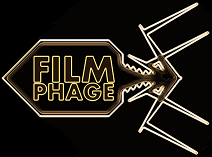 I’m The Phage! The aping of the “classics” style makes the initial 45 minutes excruciatingly hard to sit through, as the momentum is somewhat absent. There’s no immediate set up, nor a big hook to latch on to. The film is entirely character driven and no mystery really appears until about 30 minutes in. It’s only then that the film truly gets going. As you can probably tell, I wasn’t a fan of that initial period. I didn’t really know what was going on and so I started to piece together my own plot in my head. My own plot was exciting and to be honest, wasn’t far off the mark come the conclusion of the film. OK, so I didn’t predict just how bonkers it would get towards the end, but I at least knew something was awry. While we’re on the topic of “bonkers”, let’s return back to the “dark” theme I talked about. Now, annoyingly, I can’t really tell you why I found the film so dark or crazy towards its conclusion lest I spoil the plot for you. Let’s just say that some of the scenes are quite peculiar to watch. To some they’ll actually be quite uncomfortable. Those initial 45 minutes made me question just why this film had received an 18 rating from the British Film Council… but it became apparent later on. Let’s just say that India gets a lot of “pleasure” from some of the more perverse events that unwind. And they really are perverse. So what of the acting? After all, the film doesn’t help itself by rolling out the plot as slow as is humanly possible. Well, it’s… it’s… it’s OK. Mia Wasikowsa is great as India, but she’s somewhat limited by the fact that India is an incredibly sour-faced girl whose emotions range from “I’m really sad” to “I’m petulant and sad”. Well, except for that “pleasure” scene! Similarly, Nicole Kidman plays the emotionally-disturbed mother to a tee too. But there’s just no range in the role. I understand that it’s not actually possible to show off all your range in a film like this, so it’s probably more a short-coming of the film, or my lack-of-appreciation for this style, that is to blame. Thankfully, the final build-up has lots of pay-offs and really redeems the film for me, but it still ends on a somewhat odd note that doesn’t really stack up. You’ll find yourself asking “why did he/she do X, Y and Z?”. Whether this was the idea that Park had in mind when he cooked this up, I don’t know, but ultimately I didn’t care enough about the film to make me think this for long. 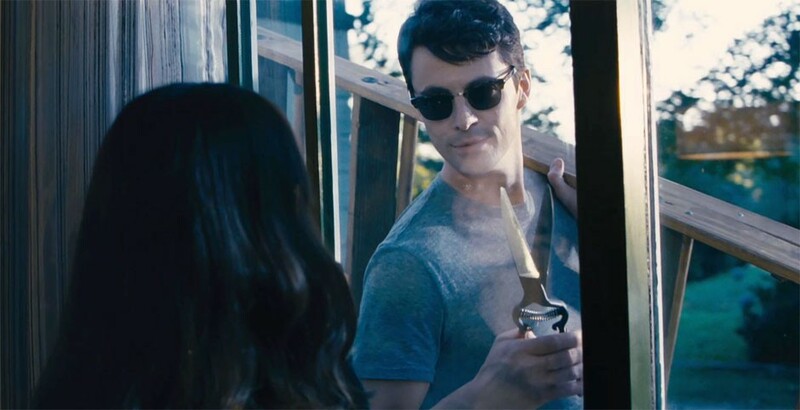 Stoker is an interesting piece of cinema in 2013. Its nods to the past will either thoroughly ignite your interest in it, or it’ll entirely put you off. If the trailers left you somewhat cold and perplexed, the film itself will do little to correct these opinions. However, if you love Hitchcock-era suspense classics, then you can pretty much disregard what I said in the past few paragraphs and thump another star onto the below score. I didn’t think the film was bad, far from it, but it just didn’t have enough pace or momentum to really engage me over its (relatively short) run time. Whilst I actually found last week’s reviewed film, This Is 40, to be dark, it was for a completely different reason. This Is 40 painted a very realistic view of what life is like once you’ve “achieved” what you wanted to. But Stoker? Well, Stoker‘s an entirely different kettle of fish. A kettle of fish swimming in crude oil that’s being sucked into a black hole that ends in the negative zone ruled over by King Negative and his dark dominions. Yes, it’s that dark. And also slightly disturbing. If you’re curious, then head out and catch this film while you can. I can’t guarantee you’ll like what you see, but you’ll definitely have an opinion on the closing half of the film. This entry was posted in Review and tagged Chan-wook Park, dark, family, Hitchcock, Matthew Goode, Mia Wasikowska, Nicole Kidman, Oldboy, psychological thriller, Stoker, suspense, thriller. Bookmark the permalink. Wonderful review man! I have to admit to be a big Hitchcock fan and if this has an ounce of his tension then I’m sold. If anything, I want to see how Park Chan Wook’s english language debut goes. I have a feeling I could take this this one. Cheers Mark! And I think you might quite like this as it definitely has a lot of tension in it if nothing else. It seems other critics loved it, so maybe it’s not a film that’s directed at people like me! Very good review! Kinda sad to hear this didn’t live up. I’m looking forward to seeing it. See, I reckon there’s hope here that you might enjoy this Keith. You’re definitely more a fan of classic cinema than me. Either it was too slow or I’m a massive heathen. But for once, I wouldn’t recommend adding Tom Hardy to this movie! I am absolutely fascinated. Feel like I need to see it just to see it now. I definitely think it’s a polarising movie. I just expected something more. The lack of momentum at the beginning just killed my vibe! Great review. I love Hitchcock’s movies so I’m very much looking forward to this. Love me some dark. Then you are in for a treat! This is one of the darkest and most gloomy movies I’ve seen in recent times. The performances were hilarious. Nicole Kidman gives the most mannered performance I’ve seen since Faye Dunaway in Mommie Dearest. Mia Wasikowska was a nice Wednesday Addams. Why didn’t she report the dead body in her freezer? Matthew Goode shows up and immediately starts acting like a Grade A creep. I don’t know about you but I was ready to call the police he showed up at their house. Probably the funniest parody of a Hitchcock film at least. Nice review. Haha! Yes!! Yes!! You’ve nailed it. She really is Wednesday Addams! And you’re 100% right on all of those points. I’m relieved to see I’m not the only one to not ‘get’ the hype surrounding this film. You sir have restored my faith in the movie community!